QUESTION: How do I know the trailer can come to my house? ANSWER: Our drivers are excellent and can go nearly anywhere. As long as your driveway or street isn’t a very sharp hill, we can come. Otherwise, you can divert us to a nearby park, church or parking lot! We need up to 55 feet of cleared space (fairly flat). QUESTION: Will the kids know what to do? ANSWER: That’s why we bring our Game Coach! He helps the kids along, inspires and instructs. We make sure it’s the party of the year! QUESTION: Should I be concerned about the types of games for kids? ANSWER: Upon booking your party, please let us know your concerns and we will address them on an individual basis and will make inappropriate games unavailable. QUESTION: What about bad weather? ANSWER: We come rain, shine, chilly nights or over 100 degrees — we are climate controlled! As long as it is safe for us to drive. QUESTION: What time should I make the party? ANSWER: We suggest that you tell your guests that the party is one hour or half-hour before our arrival time — that way they eat first and they all see the grand arrival of our mobile video game theater! QUESTION: What time will you arrive? ANSWER: We will arrive approximately 20 minutes prior in order to set-up and rest assured, our door will be open for your guests by the start of your party time! QUESTION: What if too many people show up to the party? Is there an extra charge? ANSWER: There will be no extra charge but be aware that 28 guests can play inside at one time…but with our stadium seating and outside TV’s there’s room for everybody! QUESTION: Do I request certain games? ANSWER: No need. We always bring the full game library to every event and your Game Coach will listen to, make suggestions and evaluate your needs to make your event successful. QUESTION: Do I have to pay for the party in advance? ANSWER: Our reservations go quickly. In order to hold your booking date, you must confirm with full payment on line within 48 hours of when your booking request is confirmed. QUESTION: How do the invitations work? ANSWER: We mail invitations to you at your billing address after your party has been confirmed and paid in full. 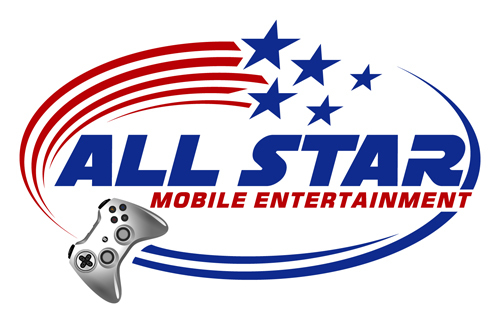 QUESTION: What type of fundraising can All Star Mobile Entertainment do? ANSWER: We can set up tournament-style or general-style gaming to help raise money for an event or simply to just have fun with a large group of people. Tournament Style: If you have a large event with many people, and you want us to keep them entertained or help you raise money, we have experience in this area. We can set our trailer up to rotate players (16 at a time) in tournament style for 7 minute intervals. It’s great fun, because the winner stays in the trailer, and as each new group comes in, they try to “unseat the champ!” The entire crowd feels as if they’re playing in one big game against each other and we’ve had great success with this “big event” format. Don’t worry about the size of your group. We will keep them enjoying the fun, and if they are buying tickets to benefit your cause, they typically jump out to buy more tickets to “keep on playing!” Where else can you have 16 people all playing in the same game against each other, and against the entire crowd? Great fun for all ages, and the Game Coach stays present to tutor and/or inspire. General Style: We can set up our trailer with up to 4 different games at once, and allow 16 people to rotate through our trailer at a time. Each time a guest enters, they must have a ticket sold by your or your organization to help raise money. Example: Tickets are sold for $2/each. We can rotate 16 players in at once for 10 minute intervals. 16 players X $2/player = $32 every 10 minutes. We generally can rotate 5 groups per hour for a total of $160/hour in funds for your organization! A 4-hour event could raise up to $640 with $2 ticket cost. You set the price of the ticket…and watch the results add up! QUESTION: Where can I view your official policies? ANSWER: You can view them here.